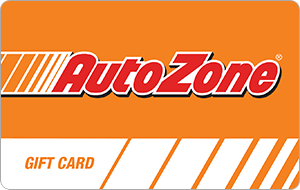 This AutoZone gift card is good toward the purchase of merchandise at any AutoZone store in the United States and Puerto Rico or online at AutoZone.com. This card may not be redeemed for cash or applied as payment on any accounts unless required by law. You may check your balance at any U.S. or Puerto Rico AutoZone store or online at AutoZone.com. AutoZone is not responsible for lost, stolen, physically damaged or destroyed gift cards, or for gift cards used without your permission. Use of this Gift Card means you accept these terms and conditions outlined above. ©2002-2017 AutoZone, Inc. All rights reserved. This card is property of AutoZone.com, Inc.